Some California environmentalists may be celebrating now that Tesla has apparently decided to build its $5 billion “gigafactory” in Nevada instead of California. Lawmakers here had toyed with the idea of weakening the state’s signature environmental law, the California Environmental Quality Act (CEQA), to help expedite review on the factory and therefore encourage Tesla to locate in-state, possibly in Stockton. But those plans fell through last week. But Tesla’s decision could be an overall setback for the environment, compared to building a factory in California. To be sure, the idea of a gigafactory is a huge win for the environment overall. The cheaper batteries will encourage more adoption of electric vehicles and also help clean our grid by enabling inexpensive storage of surplus wind and solar energy. So why is Nevada so bad, compared to California? First, the siting of the gigafactory will likely launch a major manufacturing program, with an attendant industry likely to spring up around it, in a state with much weaker regulation than California. Nevada ranked 20th among US states in a George Mason University survey of the most lax regulatory states when it comes to land use decision-making, with California ranked 49th. And a recent comprehensive survey of business owners gave Nevada an “A” on the impact of environmental regulations on business, which is not a good sign for environmental protection. California of course received an “F.” So the factory itself, as well as any future co-located suppliers, will operate with less future oversight for environmental health and safety protection. 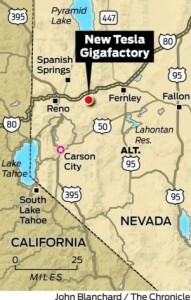 In addition, the thousands of workers who will be employed there will likely end up in new subdivisions that sprawl over the high desert countryside, if Reno’s past growth is any indication. And they will likely commute to work by car, a lifestyle that Californians are rapidly abandoning. California meanwhile is engaging in regional transportation plans that will offer alternative, more environmentally friendly housing and transportation for workers, and its environmental laws are now encouraging growth closer to jobs and services. Finally, from a shipping perspective, the factory in Nevada will have to transport the batteries by train to the major population centers in San Francisco and Los Angeles, which are the leading markets to buy electric vehicles. Locating the factory in Stockton would have reduced this shipping distance significantly, along with its associated environmental impacts, while placing the factory only a negligibly farther distance from the East Coast markets. Tesla CEO Elon Musk has said that he plans to build more such factories. And as I say, the gigafactory is an overall environmental win. Yet while California’s economy would certainly benefit from locating a future factory in-state, the environment would as well, compared to the site announced today. If significant new residential development is required, as suggested, where will the water supply com from–whether the factory if located in Nevada or California? Is the water supply strategy sustainable? so, will you boycott Tesla even if you could afford one?